If you have been a fan of Farmville, you can now make it a reality thanks to these three local youngsters and their green app. The Farmizen App was started by three founders — Sudaakeran Balasubramanian, Gitanjali Rajamani and Shameek Chakravarty. Ever played the game Farmville — Where you plant your garden and take care of your farms? It has hordes of believers, yet when it comes to reality, it could be a lot more fun, right? A new city-based app is the talk of the green town currently because it lets you practice being a farmer. The Farmizen App was started by three founders — Sudaakeran Balasubramanian, Gitanjali Rajamani and Shameek Chakravarty. The trio was very concerned about the quality of fresh produce they had been eating, and were unable to find a source of naturally grown chemical-free vegetables that they could trust. The app started with 79 subscribers and now it has 470 subscribing families across five farms. In a tête-a-tête with one of the founders, Shameek, we find out about the journey of this new app that is like a breath of garden-fresh air in the city. “In 2015, we started experimenting with growing our own food in our terrace garden, and we soon realised that there was not enough space. We also realised that growing your own food requires substantial effort and constant care and there was a gap in terms of expertise and knowledge about how to grow food. We started speaking to people, and found that many people, at least in Bengaluru, were in the same situation — they wanted to grow their own food but the lack of space, time and expertise were huge hindrances. 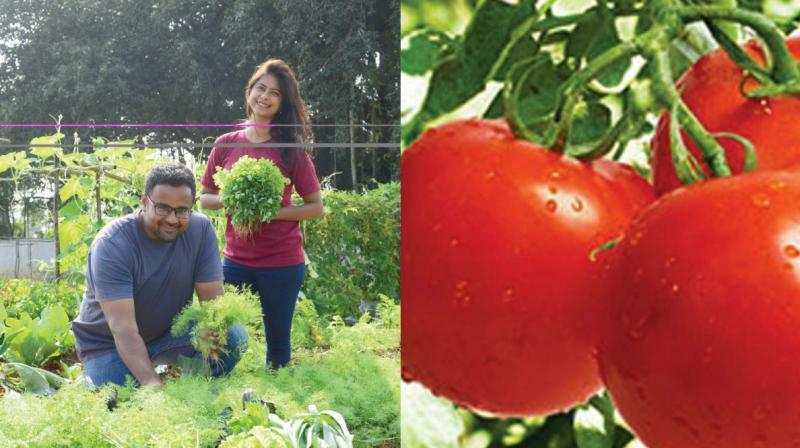 That’s when the idea of building an assisted remote kitchen gardening service like Farmizen started germinating, and we decided to pursue it as a full-time venture in January 2017,” Shameek. The brain behind the app is Gitanjali who had also founded an urban gardening company www.greenmylife.in four years ago, so she brings a lot of domain expertise to the table. When not busy managing their app and growing organic produce, Shameek is a part-time DJ who dabbles in electronic music production. Sudaakeran is fond of eating, and also ran a restaurant earlier, and Gitanjali is a trekker.